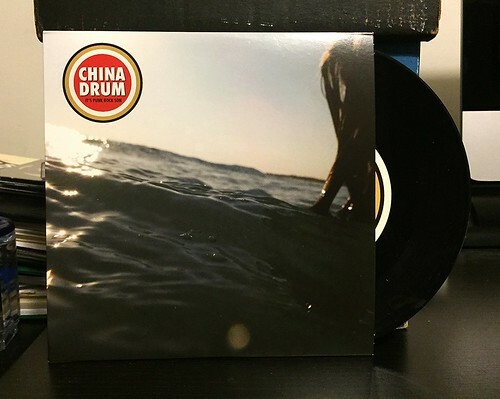 I Buy Way Too Many Records Dot Com: China Drum - It's Punk Rock, Son 7"
Early China Drum is right at the very top of my list of absolute favorites in the world. Their first few singles and their debut album Goosefair are about as good as rock and roll gets if you ask me. To this day, I still probably listen to Goosefair at least once or twice a month, it's just that good. The problem is that after that initial flurry of greatness, they put out an extremely mediocre second album. They then changed their name to The Drum and released a truly terrible record and that was that. When news came out that China Drum was back together and playing shows again I was pretty excited. Even better, they apparently were focusing mainly on Goosefair era tracks and ignoring some of the songs that I thought were sub par. Then came the news that they were writing new songs. This 7" is the first document of this new material. The return of China Drum is a two song 7" that came out as part of the Too Pure Singles Club. Luckily, it was easily available to get without joining the club. Unfortunately, this new China Drum 7" isn't very good. The A side "Water" just plods along without any real energy or purpose. This 7" is called It's Punk Rock, Son, but this song just sounds like the worst of 90's alternative rock deep album cuts. I can't fathom why this would be the song they'd lead off their resurrection with. B-side "Kitty's Burn" is at least a little better. It's faster and catchier, being somewhat more representative of the band's earlier work. But there's this ridiculous drum fill during the verse that absolutely murders the momentum of the song. Again, how could they think that this was a good idea? There is a reason most people a skeptical when bands that they love get back together again. This 7" is exhibit A. I will not write off China Drum because of this 7", but if they put out a new album, there is absolutely no way that I will blind buy it without hearing a good chunk of it first. The band has proven in the past they are capable of truly great things. But they've also proven that they are not infallible and can put out some bunk songs too.